In the past decade many companies provided “lip-service” about what they were doing, or intending to do, to make their products and company more environmentally friendly. Fiber Care Baths took real action by researching, developing, manufacturing and marketing “green” products that exceeded EPA standards. 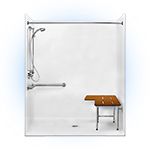 We are the proud leader in the shower stall and bathtub “green” movement within the construction industry. 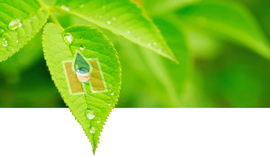 The Green movement is generally defined by the use of renewable or recycled materials and saving energy. Acceptance of eco-friendly materials is quite common today as homebuilders, developers and contractors embrace their clients' wishes to create dream homes while also saving the planet. 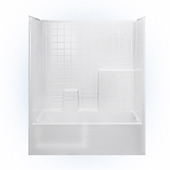 EPA studies show that styrene, a water insoluble liquid common in resins to coat and reinforce fiberglass shower stalls and bathtubs, is a significant source of volatile emissions generated by most fiber reinforced plastic (FRP) industry processes. Exhaust air from spray booths at manufacturing plants represents the major source for these damaging emissions. 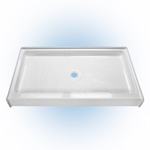 The EPA regulations stipulate that no more than 10 percent of the styrene processed during manufacturing of bath and plastic-coated plumbing products may be released into the atmosphere. Emissions may be reduced somewhat by using a vapor suppressant additive, but it doesn't eliminate styrene from the environment. Led by Stephen Hess, founder of Fiber Care Baths, 19 years of research resulted in a discovery that dramatically reduced the EPA regulation by limiting emissions to three-tenths of one percent. This achievement was a monumental breakthrough. 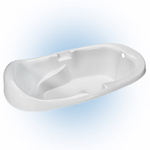 Fiber Care Baths had lowered styrene emissions by eliminating 60 percent of the liquid from the gel-coat that is applied to shower and bath units. This was achieved by replacing the isophalic resin in the gel-coat with lexan bead -- a building block for acrylic that has no harmful emissions. Hess described the new gel-coat as "quasi" acrylic. 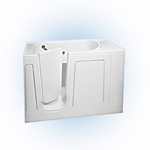 Fiber Care Baths’ discovery had a tremendous impact on the entire industry. Many companies were capped at their production levels due to emission restrictions. 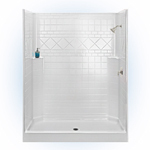 Small and mid-sized shower and bath manufacturers found it difficult to compete with larger firms because they could not increase production without buying more emission credits, available from companies that met EPA standards. Fiber Care Baths and other firms could now increase production without incurring fees. The bottom profit line was not the primary motivation for Fiber Care’s Founder, Steve Hess. Steve always had a goal to reduce emissions, regardless of what the law required. He went into the venture knowing it would cost money and was willing to try most anything. He knew that fewer emissions resulted from a better use of raw materials, which in turn would reduce manufacturing costs and disposal of hazardous waste. There would also be less concern about Occupational Safety and Health Administration (OSHA) regulations as they relate to worker exposure to chemicals. Steve’s ultimate and driving goal: zero emissions. Aside from lowering emissions, Steve Hess’ new gel-coat process had provided unexpected benefits–the physical appearance of Fiber Care tubs and showers were much improved and they were doubled in strength. The new process added some cost to the manufacturing but when factored in with installation, prices remained competitive. Scientists estimate that an excess of 20 million metric tons of styrene escapes into the atmosphere every year. Hess maintained that emissions could be reduced by as much as 90% if other firms adopt his gel-coat recipe. Much of the “Green Vision” Steve Hess had has been achieved. Builders and developers now actively engage in improving the eco-friendly nature of the homes they create and the products they include. But Fiber Care Baths, as a company, will not rest until the ultimate green visionary goal of our Founder is realized… Zero Emissions!